Last we left the Burrs, the children of Generation 4 had blossomed intoâ€¦wellâ€¦children, and their father had suffered an unfortunate accident with a certain carnivorous creeper. His hasty demise left their mother distraught and desirous of renewing her affairs with several old flames, which she kept bright through repeated use of the cuddle couch. Meanwhile, a canine named Dinglehopper joined the family, and the corgi Ariel became pregnant with his puppies. It wasnâ€™t long before Ariel gave birth to her brood, two bright-eyed young pups I named Belle and Gaston. There was such a hubbub over the puppies that the poor feline Sebastian was rather neglected. Luckily he had a crazy catnip toy to keep him occupied. Eventually young Daisy became a teenager. I rolled Pleasure for her aspiration, which made me groan at first, but now I think itâ€™ll be perfect. She just needs to get read of her sleepy tomboy look. Not quite yet, though. After her birthday, it was back to the old skill-building grind. Iâ€™m such a taskmaster with these poor teens. Work, Daisy, work! Raise those skill points! Earn those scholarships! Even though you donâ€™t really need the money. What were you expecting, my dear Daisy? A couple hundred Simoleons from Grandpa? You need to take your piano show on the road to make the big bucks, kid! Daisy’s disappointment over the bareness of the tip jar was quickly supplanted by a strange enjoyment in doing household chores. Good grief, sheâ€™s in seventh heaven scrubbing this dish! Either that, or sheâ€™s doing a commercial. She’s also enamored of the pet food. Thatâ€™s nice, Daisy, but itâ€™s PET FOOD. Not exactly a masterpiece of the culinary arts, here. Oh wait, I forgot youâ€™re a Pleasure Sim. You find enjoyment in almost anything. Even talking to that old geezer Grandpa Farley. This entry was posted in Burr Legacy by Jen. Bookmark the permalink. YAY! Its an update!I can’t wait for the 20’s! “…and promptly transitioned into a tombstone.” I know it’s sad, but that cracks me up something terrible. Hilarious! Awww, look at the puppies! My first litter was three kittens born into a house of six… sheesh! Talk about a surprise. I can’t believe it’s University time again! Poor Jen, time flies fast. The house looks amazing, the interior is fabulous. Can’t wait to see the Burr capers at College. Gassy. Ha! XD Love it. Also loved the line about Belinda coming home and turning into a tombstone. Not that Belinda turning into a tombstone was such a happy occasion, though. Later, Belinda! Daisy and Delano have both grown up so nicely! And Daisy’s a real hoot. But blech.. Pleasure sims. Like you, I prefer Family and Knowledge, but at least Romance, Fortune and Popularity have interesting wants now and again. Pleasure sims on the other hand… blech. Aw. Belle and Gaston turned out good looking! Although I understand about the clone puppies.. all my litters have been pretty similar looking too. Aw, goodbye Dinglehopper! Istill wonder why everyone in the Burr family and Ravelo Family turn out looking so nice. In my legacy challenge, the second generation twins, Maura and Pascal turned out really ugly. Thankfully Generation 3 is turning out better. If you have time, do an update about Calhoun,he was my favourite of the cousins! I’ve always preferred Family and Knowledge Sims, too. They seem to do far less annoying flapping of the arms and whining than the rest of the aspirations. Yay! A Burr update! I laughed out loud about Belinda promptly turning into a headstone and Grim “striking a pose” lol. Makes me think of Madonna’s Vogue or something hee. Puppies are so cute. Too bad you gave away the males awww. Daisy and Delano came out looking very nice! But what are their lifetime wants? Any easier than Camelia’s? Cool, another Burr update. I signed up for the mailing thing so i can know when you update. Um just a question, how do you get so close to the puppies for the pic? I cant get that close. And how do you take a pic with the roof on? Is it a setting in the game, when i try for the roof my view pops up to the next floor. Thanx and i love your stories. That is so funny that Belinda immediately transitioned into a tombstone… poor old girl. I wonder what the deal was with that… maybe the Hula girls had a wedding they had to dance at on and couldn’t make it to help out grimmy. Oh and I forgot to say I like family and knowledge the best too. Especially family cause I really like watching the kids grow up. The sims 2 is soooo good. I remember back in the days of sims 1 when you just got bored eventually because you could never grow anyone up. So much more fun now =). Wow Daisy is sure pretty to look at! I have to admit, after playing around with pets for a week, I acutally find them sort of dull. Feed, play, train, breed, ship some off for adoptions. Repeat. I think Belle is pretty for a dog. Just be glad you didn’t get a hideous genetics disaster. I read something about the ear thing. And it led me to believe its random or really favors floppy, or something. I wasn’t expecting any stick up ears when I had my litter, but I did get two of three.. one on the hideous freak of nature one. Oh truly a delight to visit with the Burrs! I can’t wait for the roaring 20’s I can only imagine what you have up your sleeve. I heart Burr Boys. Delano grew up handsome as ever and I might just stalk him at college! The puppies are adorable – and yes – there is a glitch about pointed ears and floppy ears. Two pointed ears = floppy ears – which is completely wrong. I haven’t expiermineted enough – but I don’t think two floppy ears = pointed ears. I think it might be floppy ears no matter what. (Genius there Maxis…) But they are cute. Daisy is a lovely girl, and I love her sleepy eyes. What’s more pleasurable than sleep? And I loved the line “and I shall call him Gassy” rofl! A joy as always! Thanks Jen! Ah what a fanastic update! The kids transitoned quite nicely too. Do Daisy and Delano have an easy LTWs? Gah, I LOVE the Burrs. Ah! 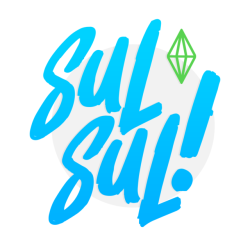 All of your sims are gorgeous!!! Are you secretly giving them face lifts? One of my legacy sims just gave birth to a baby who turned into a toddler with startlingly high cheekbones. I think I audibly yelped when I saw her. But yours are more than pretty, they’re absolutely beautiful. No fair! Anyway, your updates are brilliant, and I can’t stop laughing at every picture caption! I can’t WAIT for the next update, this is my favorite blog and favorite legacy I have ever read! Aww Daisy and Delano are such pretty teens! Personally I like Popularity and Pleasure, do tell what are their LTW’s? Great update btw! I really like Daisy. She’s the new heir right? I think she would make a really good heir. “Why does everyone pick on the corgi?” Awww. Great update Jen. I found it cool that the dogs looked like their father. Daisy rolled Pleasure, huh? That LTW is really hard to fulfill, good luck. Amy, two floppy ear parents can have a pointed ear puppy.. although from what I witnessed, it looked like a case of a puppy being the illegitimate child of the Easter Bunny. Although I’m thinking there is a Maxis screw up that leans genetics towards floppy ears. Beware the evil, pointed ear puppy! Whoa! Those dogs are insanely crazy looking, lol. Wow, did you acctually have a dog give birth to them? There’s a new gen. 4 baby over at my site, as well as a rather brilliant cat. Check it out! Yay! The puppies are so cute! Another great update as usual can’t wait until the next one either so keep up the good work! The puppies are so cool! I haven’t attempted puppies in my game yet so it’s fun too see some! Too bad about the whole Belle and Gaston being identical thing, diversity is so much better. I also thought it would be cool for one of the puppies to be a corgi, Ariel is really cool looking and I kind of feel sorry for her for being picked on all of the time. Good Luck on the kids rolling pleasure and popularity, I seem pleasure sims hard to please, as well as popularity, but don’t worry, I have faith in you! P.S. “necking parties” = truly hilarious! HOLY HUMONGOUS EARS! Are those naturally born puppies Audrey? Those ears are crazy! that dog looked crazee!I luv the pups i have one bad thing about sims 2 pets.i think that they grow to an adult 2 soon and straight after they become new born.I am going to do a sims 2 story where i have planned the 1st gen.i wanna put it on a blog but i don’t no if i’ll have time 2 write an all so we’ll c…. I really liked this! The puppies are ssssso ccccuutee. I can’t wait for more burrrs! I also think the puppies are adorable, of course, and I think they turned out to be very pretty after they grew up, too! It is a shame about the ear thing. They should be able to have their parents’ ears. I’m glad to hear I’m not the only one who thinks Pets got boring kind of fast. 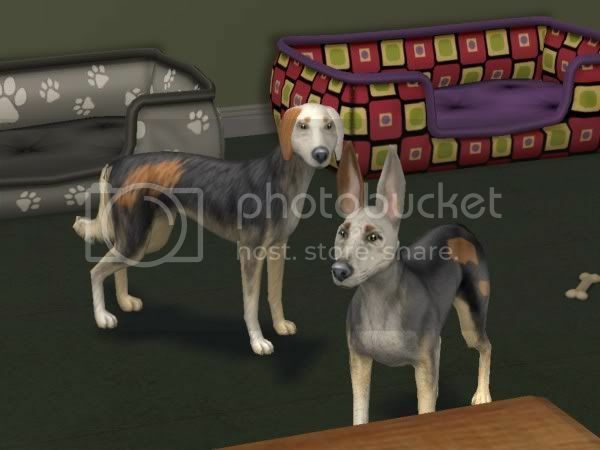 Pets are nice to see in stories (like here in Jen’s blog! )but sometimes they can sort of get in the way. Don’t get me wrong, I still love them in all their cuteness. Maybe Pinstar should make some “Pets legacy rules” to spice things up a bit. I guess I’m just so excited for Seasons to come out that I’m just focused on that now. Ack! It’s going to be SO awesome. :-) Where do I see the penguins and plant people???? I have a big problem with them in which their training doesn’t seem to have any effect! I try to train them to be calm and quiet and they still bark so often it drives me up the wall! I train them to be friendly and playful, yet they still bark aggressively on a regular basis… I located a semi-global file that I believe to be the problem, but I don’t have the knowledge to fix it.. I can only do very simple hacking… Ironically the name of the file is ‘bark randomly’ which in Maxian terms typically means to either do it non-stop or never at all. My ISBI family has one cat based off a kitty a lost last year. He’s so funny! I like the Pets ex-pack because it’s realistic.. Pets are companions through your life.. They aren’t supposed to be terribly functional otherwise. My ISBI family benefits from him greatly, always keeping the social bunny at bay.. Strangely, he’s never to be found when my camera is out. ;P Hopefully once I get him a girlfriend kitty he’ll become less elusive. Great update as always Jen! Daisy is so pretty! I love her sleepy eyes. You always get so lucky with the good looking kiddies! The pups were adorable, and are still cute as adult doggies. I can’t wait to see the 1920s! Daisy is very pretty! I can’t wait to see her in her flapper clothes. I love this legacy, It’s like a 130-year fashion show! Thanks everyone for the comments! I have been downloading ’20s stuff and doing research, so I’m really excited about the next era in the Burr Legacy. Hope you guys enjoy it, too. I’ll have to do a Basil/Calhoun update just for kicks, too. Kitty – Daisy’s hair is from XMSims. It’s a beautiful hairstyle that looks awesome in-game. Jadice, Marcie, & Jeanette – Regarding Daisy’s and Delano’s Lifetime Wants: Daisy wants to have 50 First Dates (bleh, not happening!) and Delano wants to be Mayor (can do!). Taryn – I have GunMod’s camera mod installed in my game so that I can move the camera closer to the ground indoors and out. It also lets you see the entire neighborhood in the neighborhood screen and move directly overhead in any view. It’s an awesome mod, and I don’t know how I lived without it! Big thanks to Jade for recommending it on her site! As for the ceiling tiles, those are by jgwhiteus at MTS2. You have to place each tile individually, then use the ceiling tile controller to flip them up so you can see what’s underneath. When you lower the camera into the room and look up (I’m usually in cameraman mode when I do this — the Tab key puts you into that mode), then you’ll see the tiles. It’s a pain to place all of the tiles initially, but it’s so worth it in the end and allows you to do more creative angles with your picture-taking. guess what…I did my hair differently 1 night and then i saw this update and Daisy had the exact same hair style.Yeah really i have cute angel curs at the tip of my hair and i did my hair in those kinda bunchy things 2 though i have copper blonde hair and a magic fringe that styles itself and sometimes looks like an elvis reject.aaand my fringe grows at 312721.84 mph and grows wonky when i cut it.Im covered in flyaways aswell.